20th February – Shaka Hlls Farm, Mashonaland East – Today, a 6-month pilot to test electric mobility for rural women, the first of its kind in Zimbabwe, was launched. The initiative, a partnership between China’s Tsinghua University Lifelong Learning Lab, Midlands State University Incubation Hub and Mobility for Africa, along with Solar Shack, is seeking to find a viable way to bring off grid sustainable transport solutions to small scale farmers and rural communities. 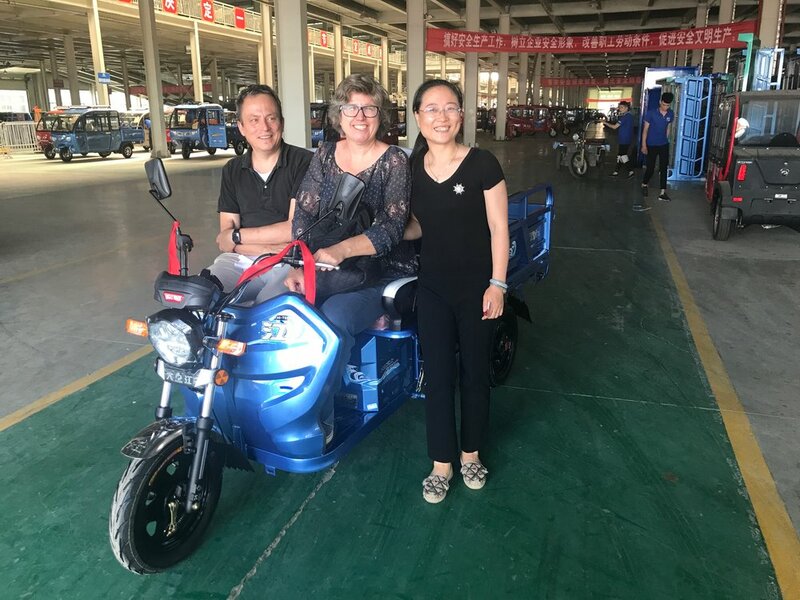 The pilot will bring 30 electric tricycles, commonly used in rural China, to rural women in Marondera Rural and Hwedza to collect evidence on how mobility can impact on social development and rural livelihoods. The aim is to collect both qualitative and quantitative evidence that can measure the suitability of the vehicle design to local conditions, efficiency of solar recharging, introduction of a leasing model, ability to improve economic productivity and ultimately livelihoods of participants. Studies indicate that more than half of the untapped potential for cultivation in sub Saharan Africa is located more than six hours from a major market, and less than 40 percent of rural Africans live within 2 kilometers of an all-season road—by far the lowest level of rural accessibility in the developing world. Ten students from China and Zimbabwe worked together to design the pilot and create an online data management system to collect evidence. During that period, the students both learned a lot from each other and worked together in teams on tackling issues such as solar recharging, community engagement and gender, how to develop a viable financial model and how to adapt the tricycles for rural off road conditions. The student exchange between the students also opened new understanding and friendship. “Zimbabwe and China have a long-term relationship politically and economically. I really appreciate what we have managed to do as students to accelerate the cultural and social interactions to make communities better” reflected Ran Aobo, a 24 year old PhD student from Tsinghua University. “Working with the Chinese students has been highly educational. We have had the opportunity to be exposed to new ideas, learn from their experience and help us unlock new skills, we never knew we had, said Kundai Takawira a student in electronic communications systems. “This collaboration and exchange with students from other countries is what we aim to achieve at the Incubation Hub stands for by promoting innovation to create new economic and social value where it is really needed,” said Dr. Patience Siwadi the Director at Midlands State University Incubation Hub. Rural women spend a larger part of their day walking long distances. They travel long distances to reach bigger markets in nearer town or just around their community where villages and houses are very distant. They also walk long distances to fetch firewood and water, often with a baby on her back and with her only pair of shoes. “The aim of this initiative is ambitious yet we believe that by providing mobility solutions targeted to rural women the aim is to improve their economic productivity without significant recurring costs,” said Felicity Tawangwa, the Director Mobility for Africa. 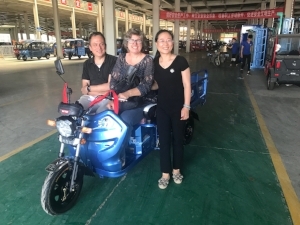 “This is a social enterprise that aims to partner with China to introduce electric tricycles whose batteries are recharged using solar energy - an abundant resource in Zimbabwe. We believe that by transforming the way women move in rural areas from point A to point B, productivity will increase and the quality of life in rural life can be improved. We believe in the local saying “musha mukadzi” which means “a home is what it is because of the woman”. Mobility for Africa Pilot Seeks to bring disruptive change to lives of rural women. We are excited to welcome members of our advisory board. Set up to provide strategic guidance and expertise to Mobility for Africa, advisory members bring a wealth of knowledge, skills and experience ranging from renewable energy, business, startups and community development in Africa and China. Members include Gordon Guo, a partner at Brunswick Beijing, who has a wealth of experience in strategy and government relations, Simon Holmes à Court, a senior advisor the Energy Transition Hub at Melbourne University, who is an advocate of renewable energy, Buhle Makamanzi, a senior communications officer at Bill and Melinda Gates Foundation, who brings two decades of experience in communications, evaluation and programme management across Africa, David Parker, CEO of ENM Holdings Limited who brings a wealth of expertise in business, and John Woo from Sinoventures, who has extensive experience in start-ups in China. On a recent visit to China, I finalized our first order of tricycles over an afternoon of tea drinking. We are partnering with Hebei Daijiang, who are based in Hebei Province, in a town about 200 km from Beijing. The company, headed by Mr. Wang has been in operation since 2005, and now produces 300,000 three wheel electric vehicles. The first container of 54 tricycle parts will be ready for shipment by the middle of November. The company will send a mechanic to help train a local team to assemble them in Harare. As we countdown to final payment for our first container load of tricycles, a very big thank you to all that have already contributed to making this possible. So far, we have raised $32,000. The good news is now we have a generous donor who will match dollar dollar every donation. We really appreciate your efforts so far and welcome any additional support to reach the $50,000 target. James and I with Ms Song in Hubei Province. We are very pleased that Joram Dambana will provide support to the local assembly of the tricycles. Jorum and I first met in 2004 when he was 16 years old. At the time he lived at Nebuha Nehanda Children’s Home on the outskirts of Harare. Most of children at the home where orphaned and had ended up on the streets. The police and local city authorities would round them up and drop them at this remote location about 40 km away from the city centre, where the hope was they would be less visible and disruptive. Joram was my tour guide on my first visit to the Home and our friendship grew from there. He was a born leader, who all the children clearly looked up. Life had not been easy for Joram, who had lost his mother when he was 6 years old, and then his aunt two years later. With no other options, he ended up on the streets, where he survived for four years before he was taken to the home and had the opportunity to start to go to school. He found his talent at school, where he become a champion in athletics, breaking the national 400 metre record. Lack of a birth certificate denied Joram the opportunity to compete in international games, a chapter which left him hear broken and despondent. But Joram is not someone who gives up. When he finished school, he undertook to study mechanics. With some the extra support I provided, he graduated and spent a year in Mozambique working in mechanics. While I kept in touch with Joram over the years, he has always managed to support himself and now his family. In 2008, he got married and had a beautiful girl called Shelly. He now runs a company that supplies timber and gum poles for mining and has a joint venture stake in a 30-ton truck company. In his spare time, he coaches school athletics. Join our journey to bring the electric vehicle revolution to rural women in Sub Saharan Africa. Mobility for Africa, a new social enterprise, wants to bring the electric vehicle revolution to rural women in Africa. While we appreciate it may be a while before we can all afford a Tesla, new renewable energy, along with advances in battery technology, mean that with the right investments in low cost electric tricycles, microfinance, and off grid charging, we have the potential to change the lives of millions of rural women. We are at a critical juncture. Without seed funding, we are finding it difficult to leverage larger grants and investment to get the pilot project moving. Hence, we would like to invite you to be part of this exciting enterprise. We have set up a crowdsourcing page that supports social causes. Besides the transaction fees, it means they do not take a cut of any investment. We need your help to raise $50,000 to invest in our first container of tricycle parts that will all be assembled locally. If you are able and willing to join us on this journey with a financial contribution (no matter the size), we would be very grateful. We also welcome any support to share and pass on the page to friends and individuals who are interested. Please click on this link to go to the crowdsourcing page. And we promise to keep you posted as we seek to bring an electric mobility revolution to rural women in Africa. After more than two decades working in international development, I am eager to use my experience and energy to make a practical, tangiible and concrete contribution. Working in collaboration with businesswoman, Felicity Tawengwa, we have set up a company called Locomotion Africa, which is trading as Mobility for Africa in Zimbabwe, and also registered in Australia. The aim is to leverage technological know-how and manufacturing skills from China, to produce low-cost quality renewable electric tricycles, and small scale vehicles that are built for a rural environment. Branded under “Mobility for Africa”, the transport will be designed to cater to the user’s need for local mobility, provide long term and low interest financing to make them affordable and ialso nvest in the longer term off grid community based renewable power solutions. The sanlanche, the Chinese tricycle, once fuel driven yet now electric, has been critical in the lives of small scale farmers in China and we believe can address some of the enormous mobility challenges in Africa. The plan is to work with social impact investors to test a model that is sustainable - both environmentally and financially for rural women. We realize the tricycles alone will not bring transformation and we will also need to develp an innovative model to reach rural communities, especially women. We believe if we can create a distribution model that works, the benefits will lead to many positive outcomes. We are working with Chinese colleagues to identify a strategic partner, and identify philanthropy investors to pilot the project in Zimbabwe in January 2019. We already have a commitment from China's Tsinghua University to bring some students to collaborate with students from Midland State University's Innovation Hub to identify technical, social and financial solutions for the field testing. Ultimately, we would like to prove the model and then seek to build a market, and invest in local manufacturing and expand distribution to other countries in Southern and Eastern Africa. While we would aim to sell commercially, we ideally would seek to redeploy investments to target rural poorer communities, using a social enterprise model that provides a package of services from skills to low income financing. Feel free to get in touch to learn more about our plans or ask us questions. We really appreciate your faith and support in translating this idea into a reality. Thanks again and we look forward to staying in touch. When I was 23 and beginning a career in international development, I lived in a rural Zambian village. Like every other household there, I had to walk 2 kilometers to the river for my water supply. Unlike every other household member, I did not know how to carry a 5-liter bucket on my head. I provided the young girls and older women ample supply of entertainment. At least until they kindly taught me the finer points of water lugging. I was immensely grateful at that time. But it is a lesson no one should have to learn. Access to water should not require an arduous trek to a river. Yet, 24 years later it remains the necessity for many rural African women. Why are women still spending so much of their day carrying the heavy burden of walking long distances overloaded with water, firewood or food to feed their family? My conclusion is simple and unscientific: The men, who had plenty of time to sit when I lived among them while the women fetched the water, raised the children, prepared the meals and toiled the field, had no incentive to alter the status quo. And the women had no extra time to innovate. Mobility is critical to development. Long distances to health facilities increase women’s and children’s mortality. Long walks to school force children to drop out. Harvested crops rot before they reach a market. Hours are wasted collecting water, and new economic opportunities are missed. Even though these impacts are well understood, mobility remains neglected in Africa. Lack of affordable transport and road infrastructure is an enormous barrier for millions of people globally to access social services; it stunts economic growth and reinforces social isolation and gender inequality. According to the Food and Agriculture Organization of the United Nations (FAO), 80 percent of farmland in sub Saharan Africa is managed by smallholders (up to 10 hectares of field) and almost 50 percent of them are women. The FAO estimates that with more productive resources, women farmers could increase yields on their farms by 20–30 percent, which would then lift-up to 150 million people out of hunger. Smallholders provide up to 80 percent of the food supply in sub Saharan Africa. Roads alone do not solve the problem. Availability of transport is also critical. While there has been investment in building roads, there is still a huge network of rural areas that depend on gravel roads that are not serviced by regular and reliable transport. Studies indicate that more than half of the untapped potential for cultivation in sub Saharan Africa is located more than six hours from a major market, and less than 40 percent of rural Africans live within 2 kilometers of an all-season road—by far the lowest level of rural accessibility in the developing world. This means rural farmers suffer a huge cost in both time and finances to take their goods to market. Bicycles have provided some relief. But they are not ideal for juggling heavy loads or children. Motorbikes are also inadequate for fetching water, transporting children or transporting a harvest. The second-hand cars that have flooded the cities have increased the possibility of car ownership for the aspiring middle-class households but are out of reach for smallholder farmers. Private passenger vans service the rural and urban routes in many areas of southern Africa, charging a fee per rider. Buses cover routes town to town. Motorbike taxis and small tuktuks imported from India are common in urban areas in East Africa. So how could the women of subSaharan Africa innovate to reduce their level of poverty? In China, rural mobility has been a critical factor in raising incomes and enabling access to bigger markets. The utility of small electric bicycles and tricycles has transformed the way people live and work. Across the country, small-scale farmers and businesspeople are using electric cycles to better reach consumers and needed services. They are reducing the time and cost of moving goods and people. Tricycles are helping women gain independence and reduce workloads. They are easy to use and carry children. And they are cleaner for the environment than petrol-powered options. While African leaders now plot out continental transport routes to grow internal trade and commerce and seek assistance from the Chinese government to build highways and high-speed railways, the smallholder farmers—the backbone of subSaharan African agriculture—appear to remain neglected. With the revolution in renewable energy, especially electric transport, there is no reason that the world’s poorest people should be bypassed. The time has come for a true poverty revolution in rural Africa. Affordable transport can deliver that goal. With the cost of renewable technology dramatically falling, new breakthroughs in electric batteries and with mobile technology making microfinancing options available to rural populations, community-based distribution systems can put an electric bicycle in every rural household. Electric wheels can take women and their families to new levels of self-sufficiency. I recently left the United Nations work to return to Africa to pay back the water-fetching lesson I was given so long ago. I want to help make women’s lives a bit easier and healthier by giving them a key to poverty-reducing mobility. With dedicated partners who believe in the cause and bring great talent, I have registered our start-up in Zimbabwe. The plan is to pilot a model with small-scale farmers that demonstrates the potential of electric cycles through community-based distribution. After initial door knocking and without a big NGO brand, I realize it is tough to attract investors interested in rural African women. To get the cycles rolling with a pilot project in January 2019, we have launched a crowdsourcing campaign. We intend to send our first shipment of electric tricycles by mid-October. While progress may not be as fast as I would like, I know that, for the millions of women in rural Africa, the potential for making their lives a little less arduous and the trek to the river a little easier is worth the perseverance. Claudia N. Berg, Brian Blankespoor and Harris Selod: Roads and Rural Development in SubSaharan Africa, Washington, D.C., 2016.